A delicious chicken and rice bake dish, layer the lemon garlic chicken breast recipe with rosemary flavored rice, sauted vegetables and a creamy Parmesan white sauce. Preheat oven 350°FIn a medium sized pot bring chicken broth to a boil, add rice, rosemary sprig, salt and pepper. Cook for 30 minutes. Rice should be cooked to a very loose consistency. Remove from heat, take out the sprig of rosemary and set to the side. 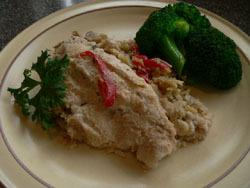 Using a microwave safe dish large enough to place 4 chicken breast in one layer. Season with garlic powder, oregano, juice from 1/2 lemon, salt and pepper. Cover with plastic wrap and microwave for 5 minutes. Set to the side. On medium, heat a non-stick frying pan with 2 tablespoons of oil. Add onions, saute until slightly translucent. 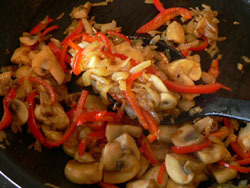 Add garlic, mushrooms and red pepper. Continue to saute and stir until vegetables are all soft and slightly browning. Mix with rice. Stir in white wine. In a small sauce pan make the white sauce. Melt butter. Mix in flour and cook until bubbly. Add slowly a cup of milk. Cook on low heat until smooth and sauce starts to thicken. Blend in cheese, salt and pepper. Prepare a bake dish with cooking spray. Spoon the rice vegetable mixture into the bake dish. Cut the 4 slightly cooled chicken breast in half for 8 servings. Place the cooked chicken on top of the rice mixture. Spoon the creamy Parmesan sauce over the chicken. Sprinkle bread crumbs and garnish with red pepper and chopped parsley. The Chicken and Rice dish is ready to put in a 350°F preheated oven in center of oven and bake for 20 to 30 minutes until heated through. This chicken casserole can be made a day ahead and kept covered in the refrigerator. Add couple pats of butter and bake 15 minutes longer.